Another of my wife's pre-retirement roles that has been transferred to me is doing the laundry. This does not suggest that I was never of help to her in the past. But it is now my responsibility. Like many other men, doing the laundry has always been an anathema to me. The reason still escapes me other than the speculation that this is "woman's" work and thus represents a demeaning of one's masculinity. To be truthful, I never liked doing the laundry, despite its relative ease, especially in todays modern world. You plunk a load of clothes into the belly of a machine, plunk a few coins into a slot, push a button and in a half hour or so , the wash is done. It may feel a little uncomfortable to tug at sopping wet clothing and transfer dripping sheets, towels and undergarments into the belly of another machine, but this passes quickly. And at the end, the lightened touch of warmed garments adds a tad of pleasure to the task. The Zen tradition of -"after the ecstasy, the laundry-" reminds me that spiritual maturity allows us to recognize the divine in all things, so that we can be grateful even for doing the laundry. I make every attempt now to bring mindfulness to this effort. I remember my mother engaged in washing and drying clothes. It was quite different then. I faintly recall the washing board and my mother's soapy fingers and bulging forearms as she scrubbed devotedly to properly and hygienically care for her family. Not the mechanical dryer in the corner of a hidden room but the clothesline publicly, almost proudly, stretched through the air above our grass-less backyard, was the locus of the last stage of the laundering process.Wooden clothespins snapped on to the tips of sheets and towels , underwear and shirts, colors of every kind flapping in the sun drenched breeze. Today technology has rescued us from the drudgery and toil of cleaning clothes. Should this not be a source of much gratefulness? Are there not still millions of mothers in third world countries beating away at garments alongside the shores of rivers and streams, pounding the dirt and sweat out of coarse fibers with the stark strength of human muscles and sheer family duty? As the machine whirs away , I return to the comfort of my sofa, to read, to write, to think or to simply rest, as I await the passage of a half hour at which time I return to transfer these threads into a different enamel box. Again , I slip a few coins into a slot, press another button, and return to the pleasure of my previous activity. Finally the laundry is done. I bring the bundle back to the apartment to fold and return to their proper places. I am suddenly surrounded by the fragrance of cleanliness, the soft warmth of a sheet's smooth surface. Struck by the sensual delight of touch and smell, I again attentively acknowledge being grateful for these simple yet fundamental sources of human pleasure and joy. Perhaps , if we look closely enough, if we open our hearts to the infinite gifts of doing the laundry-like tasks of life, we will discover something of the ecstasy that we so desperately yearn for. In the spirit of our capacity to be grateful, I would reconstruct the Zen saying in the following way- "After the laundry, the ecstasy." The immediacy of the everyday duty is a gift which bestows its bounty upon us. Doing the laundry can, after all, be uplifting. From the lofty heights of Sinaitic principles in the form of Ten Commandments, this week’s Torah reading,”Mishpatim,” laws or ordinances, descends onto the plateau of everyday details that give direction and structure to our daily lives. From regulations guiding our behavior toward the stranger and the unprotected to ritual matters that touch upon our diets and harvest celebrations, the law embraces the totality of our existence with its inhibiting limitations of spontaneous impulses that simmer within the human heart . To many such legal restriction is regarded as a burden, an infringement on the fullness of freedom that human instinct demands. Such control calls forth resistance, at times violent rebellion . Thus the antinomian strain within human experience. In stark opposition to Judaism’s demands of fulfilling the law as a path to redemption, early Christianity, in the words of Paul, declared the liberation from the law by way of faith in Jesus as the preferred way to personal salvation. True freedom was found in faith while subservience to the Law was regarded as secondary at best , and at worst, the continuation of spiritual slavery. Mishpatim’s centrality in Judaism is unmistakable. For the Jew, law is not a burden but the highest gift of God to humanity. Not only abstract generalizations but especially the nitty-gritty of discerning the just and the righteous within the murky messiness of everyday human activity and struggle is the task of Torah. To eke out a spark of justice from the clouds of human greed, fear and violence is the great moral mandate of the Jewish ideal. At the conclusion of God’s dramatic revelation we are told that Moses entered into the fog, the thick cloud,the “arafel," out of which God spoke and enumerated the myriad rules contained in the Sabbath reading of this coming week. The great achievement of the legal enterprise in human life is its process of shedding the light of civility and responsibility upon the domains of human activity that are shrouded in confusion and chaos. Law gives us order and predictability, and as such it frees us from the dread of utter fear and insecurity. It is no surprise that the rabbis regarded the student of Torah as the authentic liberated individual. It was through the commitment to the Law that the Jew discovered her freedom. For this he continues to be grateful, thankful for the most precious of all gifts, that of Torah, as God’s most cherished expression of love and concern. We are blessed with the proximity to many wonderful food shopping outlets which offer the buyer everything and anything, catering to the widest culinary needs from the "glatt kosher" to the strictly "vegetarian" . While food shopping is essentially pedestrian and not terribly exciting -for many it is an unavoidable burden- I have tried to transform these tasks into moments of adventure into gratefulness. As I step into this fantasy-like planet overflowing with produce from the four corners of the world, I pause to thank, aware of a flood of sumptuous sights and smells. 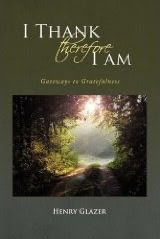 I recite a silent prayer of gratefulness-"Ha-zan et ha-kol"- Who sustains all life, for having so much within my reach. At that moment an image flashes through my mind, of a visit to Romania 10 years ago as part of a rabbinic mission to transient Russian-Jewish communities in Italy, a memory with a broken heart, the empty, desolate shelves of grocery stores throughout Bucharest. Needless to say, the awareness of the millions of children who go to bed with aching, empty bellies weighs heavily on my soul as well. I approach the coffee stand, eager to get my regular soy latte. Alongside a woman in front of me, perched on a seat on the edge of the shopping cart, is an angelic looking child, smiling with delight at the excitement of her new and changing surroundings. "BABA," she gurgles.My heart melts as I take in the joy of witnessing the innocent pleasure of a little girl babbling in a supermarket. I chat with the mother who tells me the child's age and her as yet primitive language abilities. I extend an honest compliment about her child's adorableness, and am profusely thanked. My coffee arrives, and the first sip adds a further coating of contentment to the lingering light-heartedness of the little girl's enchanting smiles. Another store, another profusion of plenty. In my world of abundance, each outlet provides a different sought after item. An ebullient smile greets me from behind a counter at which a cheerful and most charming gentleman with a foreign accent-I later find out that he is Belgian-offers me a sample of a new breakfast product for that day. Several moments of undistracted delight are spent with this man, and I continue my search for a food not available at my first stopover. My adventure ends with a casual conversation with a pretty cashier, who when asked perfunctorily how she is , proceeds to quietly but buoyantly tell me of her joyful tiredness, her being a mother at the young age of 22, grateful to be energetic enough because of her age to not only work but have the strength to spend special moments with her child each day after work. I return to the car, and catch myself still smiling. So much has happened in the course of this simple, ordinary food shopping day. So much of the bounty of life has spilled over into my awareness, generating a sense of gratefulness that converted the effort of finding certain foods into an excursion toward the fullness of life. I can't wait to go food shopping again, sometime soon! My cousin is dying. Unexplainably, unexpectedly, his entire being has been assaulted by an irreversible degenerative disease. He is barely sixty years old, a university professor, the father of two girls, and a darn nice guy. We grew up together. He and his family occupied the upstairs of a duplex, and we were down below. It was not out of the ordinary to be privy to my aunt’s shrieking castigations and my cousin’s ensuing piercing protestations of defense. We hung out together, sat together at family Passover Seders, skated together on the icy surfaces of Canadian public skating rinks, threw snowballs at one another, attended the same school, and drank together into the wee hours of the morning on the eve of my uncle’s funeral. He lives abroad. I haven’t seen much of him in the past 25 years. On occasion, when visiting this part of the world, we would talk-either in person or over the phone as he placed a last minute call a few hours before his flight back to England. He is very bright, a man of ideas and ideals. Living simply, almost to the point of self –deprivation, he nevertheless succeeded to see the world. Not from the vantage point of five-star hotels, but in the midst of the masses’ huddle of humanity. A skeptic and cynic, he was never bitter. Rarely did he raise his voice-at least not with me- in heated argument. In our health conscious society, he was the last of the junk food junkies. His imminent passing, together with my own advancing age, has elicited a constant and inescapable flow of feelings of my mortality, feelings reflected best in the opening words of Ecclesiastes, “Futility of futilities; all is futility!” I wonder about life’s meaning, knowing that it is merely a question of time before I too drop over the edge of human existence. Indeed the future is frightening. What about the past? I don’t deny a surge of reminiscing in my waking hours as well as during dream-laden sleep. Sadly, these dreams are neither sweet nor reassuring. I awaken fitfully, or exhausted from the struggle with a past that I wish I could have changed. How do I preserve my sanity, a sense of the beauty and blessing in life? Whatever I do, whatever I enjoy and anticipate, I interpret and understand from the perspective of the giftedness of the present moment. Without the recognition of the fullness of the now, I wonder how I would find the psychological and philosophical rationale to continue life in a way that makes sense. I have absolutely no intention of deliberately ending my life. I am neither depressed nor suicidal. Yet, is it not natural, even logical to feel the absurdity of life, to perceive life as merging with the meaningless? My only refuge is in the blessing of the moment, the richness and the fullness of each passing minute in which and for which I am able to say thank you and carry a feeling of gratefulness deep within my heart for the gift of each single second of breath, sight, taste, touch, music, laughter, even the shedding of tears? And so my dedication to the spiritual pursuit of gratitude. When gratefulness slips from my heart’s grasp, I am terrified, alone, adrift in a sea of uncertainty and dread. The past is no longer, the future unknown, its ending finite and final. All we have is a fleeting now, with moments meandering between what was and what will be. To be grateful for this gift of what is, that is my refuge and my strength. A common concern and complaint of parents today is that children are captives of technology. The computer, the cell phone, video games, television have all emerged as first line companions of the young. Endless hours are spent in the company of these machines. Much is positive-easy access to a wealth of information and ideas; much is harmful-knowledge and concepts that are detrimental or inappropriate to minds incapable of discriminating effectively in the ocean of stimuli and input. Parents bemoan the loss of human contact, fearful that their progeny will somehow mature as disconnected hearts and souls. The mind may progress beyond the intellectual boundaries of yesteryear; what about the child’s psyche, the inner spirit of feeling and humanity? Yesterday was a moment of reassurance and hope, a beam of light in the midst of an ever- dominating darkness of technology’s undue influence on our young. About 30 children from the ages of six to sixteen sat around beautifully decorated tables covered with paper plates of fruits and nuts, white and red grape juice, and booklets containing the Tu Beshvat Seder, a celebration of the New Year of Trees, a time of planting in Israel, a time of spiritual renewal of people’s spirits everywhere which are rooted in the reaches of heaven. Children sat alongside parents and teachers of the religious school of a small congregation in Annapolis, Md., singing songs of planting and reaping, songs of seasonal change and the renewal of earth, sun, and sky. Serious moments were interspersed with injections of jest and humor, children’s skits pertaining to the holiday, and the good cheer of people simply being together and sharing in the visceral gratitude of nature’s bounty. It was assort of Thanksgiving, and at the center of our rituals was the awareness of a Source of all things, a God whom we praised and blessed with each bite of fruit and each sip of juice. I sat opposite several young children and their parents and was deeply moved by the smiles and sense of inner security and peace reflected in each joyful face. I was struck by the renewed recognition of the power of religious ritual to bind individuals and families into a community of caring and nurturing souls. It became evident again of how indispensable the presence of people is to the human development of human beings, both young and old. The setting was simple, almost primitive. Nothing inordinately ostentatious, costly or technologically complex. Handmade decorations, paper cups and plates, natural fruits and nuts unembellished by a gourmet’s hand, and an awful lot of commitment and love by parents, teachers and volunteers, created an indelible moment of magic and enchantment. I left this simple celebration enriched and inspired. It was an abiding reminder of the eternal power of ritual and spiritual connections to enhance our sense of ourselves and rediscover the wonder of intimate human relationship. In the midst of a freezing wintry day, I began to look forward to Passover when once again, children and adults will share ancient rituals and thereby renew not only their Jewish ness, but their humanity as well. PS. "All children need a laptop.Not a computer, but a human laptop...someone to hold them, read to them and teach them..loved ones who will pass to the next generation their expectations of them, their hopes, and their dreams. "-General Colin L. Powell, inscribed on the side of a Starbucks coffee cup. 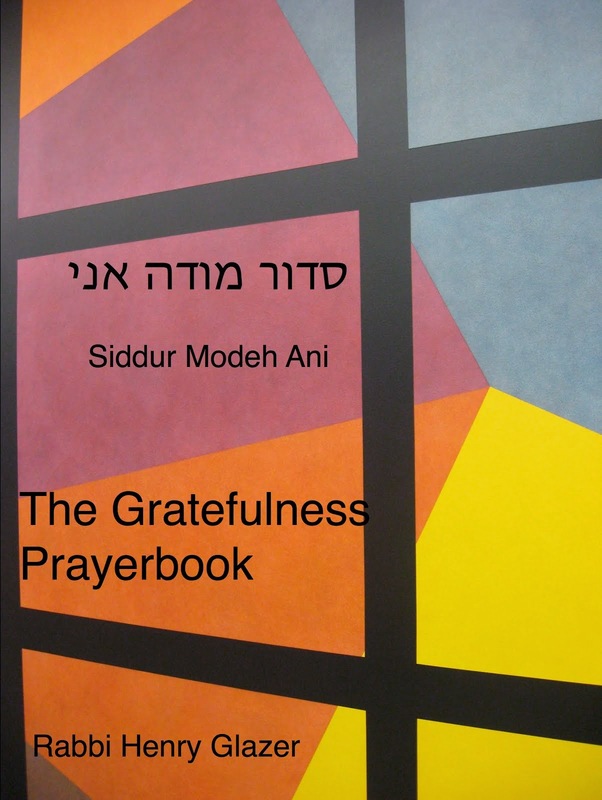 What makes this song so essential to the spiritual experience of the Jew is that it occupies a place of great importance as a prototype of all experiences of deliverance and the ensuing religious response of gratefulness that is expressed through songs of praise and thanksgiving. the day from being like any other day into a day of gratefulness and utter contentment. Is ever alone for a single moment. One of the collateral delights of daily minyan are the informal exchanges and chats shared by participants at the end of prayers. This morning, a congregant took me aside and excitedly related the following joke. I laughed heartily and expressed my gratefulness for brightening my day with a little humor. I thought: What a simple way by which to bring some joy to others? A funny story is a gift for which we can all be grateful. In this spirit, I share with you the joke. The rabbi of a small town passed away. When the mourning period was over, the townspeople insisted that the 'rebbetzin'-the rabbi's widowed wife, remarry as soon as possible. For the rebbetzin to remain single was considered most improper. The only available man in town was the butcher. After some protestation, the deceased rabbi's wife agreed to marry the butcher. On Friday morning of the first week of marriage ,the new husband informed his wife that according to the teachings of his father, intimate relations were required that morning before work. The widow had no choice but to comply. That evening, prior to the Sabbath prayers, the butcher claimed that his sainted mother had taught him that cohabitation was a mitzvah- a religious duty, at the onset of the Sabbath. Before bed time , the rebbetzin's new husband indicated that his zeide, his grandfather, instructed him that love-making was required at that time. The next morning, before setting out to the synagogue, he turned to his bride and told her that his 'bobbe'-his grandmother emphasized the importance of carnal relations on Shabbes morning before shul. The following week, the butcher's wife was met by a prominent townsperson. "How is your new husband?" she asked. The wife replied: "He's no scholar, but he comes from a wonderful family!!" If you smile, be grateful. If you laugh, be even more grateful. If in the course of time you remember the humor of this story and it brings a smile back to your face or a sense of lightheartedness into a demanding day, consider this as a gift for which to be grateful. When all is said and done, is not the capacity to smile and laugh a gift from the Source of all joy? Tu Beshvat, (numerical value of “TU”: “Tet”= 9, “Vav” = 6), the fifteenth of the Hebrew month of Shevat, is almost here. Considered by the Talmud as the New Year of trees, since the 16th century Jewish mystics have celebrated Tu Beshvat with a Seder similar to that of Passover. Four cups of wine were drunk; white wine represented the whiteness of winter while the red wine elicited associations to the full warmth and lushness of summer, and mixtures of white and red wines symbolized the transition phases of spring and autumn. A wide variety of produce associated with the Holy Land is eaten. The number fifteen has specific mystical significance in its equivalence to the numerical value of the first two letters in the Tetragrammaton,( yud=10; heh=5 ,YAH) the original name for God. Thus mysticism understands God’s Presence to suffuse everything, especially the bounty of the land that nurtures life. Unlike the Passover in many ways, one culinary feature stands out. Passover enjoins a full and satisfying repast; eating of the Paschal lamb in Biblical time, a full entrée. Tu Beshvat ordains only appetizers, fruits and grain products ie. cookies, designed not to satiate as much as to stimulate. Tasting is the order of the day. One particular experience that made a deep impression on me while at the retreat program at Eilat Hayyim was the eating meditation. Each participant was given an item of food i.e., nuts, dried fruit, and instructed to eat not only slowly but mindfully. We first touched the food to gain a sense of its tactile texture; then we smelled the item to make conscious the olfactory aspect of the eating experience. When we had the food in our mouths, we did not chew and swallow quickly or immediately but rather let the food rest in our mouths to mindfully become aware of the foods’ various qualities of solidity and taste, the subtle dimensions and sources of giftedness each food item could impart to us. Only at the end of this process were we instructed to swallow. Each meal thereafter became a marvelous experience in mindfulness eating which greatly enhanced the spiritual meaning of the act and imbued us further with the sense of greater gratefulness for our food. At the conclusion of the retreat, I remember my first meal with my family. They were utterly astounded when they observed how I ate, slowly and with mindful deliberation. This was in stark contrast to how I used to gobble down my food and be the first to finish the meal at the family table. Food has become a source of great wonder and giftedness, a genuine mystery and reason for endless gratefulness and praise.
" I appeared to Abraham, Isaac and Jacob as El Shaddai..." Loosely translated, the term means "Almighty." It is commonly found in the prayer book, on the Mezuzah-the small receptacle containing selections on parchment from the Torah that are affixed to the doorposts of Jewish homes- and its first letter, "shin," is duplicated on our hands when we tie the straps of the teffilin, the phylacteries to our arms for daily morning prayer. Some suggest that the origin of this divine name is related to the Akkadian "sadu," a mountain, which implies might and permanence . Others connect the name to the Hebrew for breasts, "shadayim," reflecting the nurturing part of God. Most scholars maintain that the authentic meaning remains elusive. The Midrash, Bereishit Rabbah, 46:3, offers an interpretation that I consider to be unusually imaginative and evocative. The name of "Shaddai" is employed for the first time in the Bible immediately prior to the commandment of circumcision. The Torah tells us:"...the Lord appeared to Abram and said to him:I am El Shaddai..."(Genesis 17,1) The Midrash comments:"The Holy One Blessed be He said to Abraham : I am SHADDAI- DAI-CHA-it is enough-Hebrew, "DAI"- that I and you are in the world, and if you refuse to accept the mitzvah of circumcision, "DAI", it is enough , for my world to have existed until now...(Abraham then points out that without being circumcised he is more vulnerable to his enemies)...the Holy One Blessed Be He said further:"DAICHA"-it is enough for you that I am your God and Protector and the God of the world and its Protector..."
Clearly a great deal rides on the mitzvah of "Milah"-circumcision. Yet, there is a strong sense of God articulating a deep sense of gratefulness for His relationship with Abraham, recognizing Abraham's loyalty and love as suficient reason for which to acknowledge a response of "DAYENU"- it is enough for me and I am grateful. Typically, we tend to understand God as a demanding God who insists on the observance of many mitzvot and a very high standard of moral and pious living. While this is an accurate reading of the sacred texts, nonetheless I would like to consider something a little different about God emerging from the above mentioned Midrash. One can interpret a component of this text to point to a God who has the capacity to be grateful and demonstrate this aspect of His identity by way of one of his identifications , SHADDAI, a God who can express an experience of gratefulness for the special relationship of love shared with Abraham. Interestingly, what elicits gratefulness from God is in fact the love of a human friend and companion.Gratefulness and love are intertwined as threads in the cloth of intimate relationship that envelops God and man. The writings of our Sages can be compared to a crown, the crown of Torah which is referred to beautifully in the Ethics of the Fathers, Chapter 4,17. This crown is studded with the precious gems of wonderful insights of instruction and inspiration. One of my most beloved Jewish "crowns" is that of the Maharal of Prague. (Rabbi Judah Loew, seminal Jewish thinker, 1525-1609.) A sparkling jewel on his crown is a delightful play on words that reflects the spiritual importance and endurance of the quality of gratefulness in one's life. He quotes Ecclesiastes, Chapter 5,9,which points to the insufficiency of material wealth as a source of happiness. "A lover of money, lit.silver, never has his fill of money." The Maharal cleverly correlates the Hebrew word for money or silver-kessef- to the verb-kassof- to long for, to desire. Not only is material wealth a natural desire, but embedded in this desire for money is the psychological risk of on-going frustration and unhappiness because of wealth's inability to satisfy our human need for fulfillment. Furthermore, another Hebrew word for wealth- zahav-gold, contains a double dimension of meaning that can be either detrimental or helpful in the pursuit of spiritual happiness. He exercises another word play, dividing the Hebrew world-zahav-into its two syllables, each of which spells out another word: zeh-this, hav-give. In other words, if the individual is attached to the need to have gold given to him, then he is trapped in the web of endless desire. 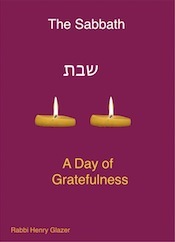 However, if one understands the meaning as "to give to others," namely, the mitzvah of zedakah, the sacred duty to give and to share with others, especially out of a recognition of having been given to by God, then gold becomes the golden opportunity for the acquisition of gratefulness and inner spiritual satisfaction. Perhaps this is the reason that gold -zahav-is regarded as more valuable than silver-kessef. Grateful for the Torah of our tradition. The dictionary definition of gratefulness is associated with grates, which means – “free, pleasing.” We are given life without doing anything, without deserving it, without having to struggle for it. It is free, a pure gift. Life is unexpected; it comes as a “surprise”. It is not frightening or worrisome but rather a source of anticipation, excitement and wonderment. Viewed this way, life can become an endless source of gratefulness. 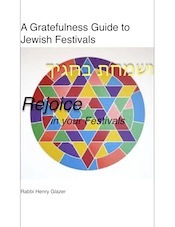 The Modern Hebrew word for “gratefulness” is hakarat hatov, which can be translated as the “the recognition of a favor.” I would submit that this term has another definition that is highly germane to our topic. In Hebrew, lehakir, the infinitive form of hakarat, “to recognize,” can also mean to “make the acquaintance of” someone or something. Tov can mean “favor” or “goodness.” Simply put, the power of gratefulness lies in its capacity to allow us to become emotionally and spiritually acquainted, in one’s heart and soul, with the reality that all things, in some profound if not entirely observable way, are intrinsically – good. To be grateful is to see life as a constant source of goodness with which all people can make a warmer and more honest acquaintance. I was blessed , as I am very often, with this form of illumination in the course of a discussion in my "little"(But by no means lesser) synagogue in the lush woods of Annapolis last Shabbat. 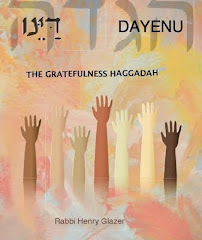 I shared the importance of the BIRCHAT HAGOMEL-posting dated 1/4/08- elaborating upon the term-chayaveem-undeserving or obligated, those referred to in the blessing as being grateful for favors bestowed upon them in spite of their "undeservedness." One participant, a physician, a wonderful family man and a learned and sophisticated Jew, highlighted what he considered to be of utmost importance associated with seeing ourselves as undeserving yet receiving the benefit of surviving danger and crisis. To him this term only magnified a profound spiritual awareness of our being loved 'unconditionally' by God or by whatever transcendent source one believes enables us to live and overcome the hazards of life. Like a loving parent, our love for our children is or should be ultimately unconditional , with no strings attached. By reciting the blessing at a moment of feeling rescued and delivered from mishap, although undeserving, we gain a keen awareness of a dimension of life that saturates our spiritual world with an experience of being loved, protected and taken care of; the world is not a callous , dangerous and scary place but rather a home in which we can feel benevolence , care and love. I fully realize that most of us , myself included, have an almost naturally jaded view of the world, one that suggests not hopefulness and compassion but cynicism and distrust. With all the misery on this planet, dare we envision a reality for which to be grateful? Is this not a fantasy, a fool's dream? Yet, how can we entirely deny the prospect and possibility of a loving and concerned reality that suffuses our ambiance of human awareness with hope ? Can we in fact live meaningfully without this spiritual supposition? I think not. Thus my commitment to the promotion and cultivation of our ability, nay,our gift of gratefulness, without which life's sacredness dissolves into absurdity and futility. We acknowledge a Divine Source which bestows favor and goodness upon us whether we are deserving or not. Knowing this is a great comfort and a reason to awaken each morning with words of praise and thanksgiving on our lips "MODEH ANI LEFANECHA." I am thankful in Your Presence. SINCE MY RECENT CAR ACCIDENT-SEE POSTING 22-JAN.2, 2008- I HAVE RECEIVED MUCH CONCERN, SUPPORT AND ATTENTION FROM FRIENDS, FAMILY AND ACQUAINTANCES ALIKE .IN RELATING MY TALE OF WOE-WHICH THANKFULLY INCURRED NO FURTHER DAMAGE THAN SEVERAL THOUSAND DOLLARS WORTH OF CAR REPAIR-I HAVE DERIVED SOME SUBTLE DELIGHT FROM THE RECOUNTING OF THE EVENT. AFTER ALL, I AM VERY MUCH IN THE LIMELIGHT AS I SHARE THE UNFORUNATE UNFOLDING OF THIS ‘SMASHING’ CONCLUSION TO THE OLD YEAR .PEOPLE WHO OTHERWISE WOULD RESPOND TO MY CONVERSATIONS WITH POLITE ATTENTION NOW APPEAR SINCERELY INTERESTED, ENGROSSED IN MY ACCOUNT. TOGETHER WITH GENUINE CONCERN, I HAVE ALSO DETECTED A SENSE OF PLEASURE, EXPRESSED IN HUMOR AND LAUGHTER, MEANT I AM SURE, TO LIGHTEN MY BURDEN OF DISTRESS AND UNHAPPINESS. BEYOND THE HUMAN RESPONSE TO HELP ANOTHER LURKS, I BELIEVE, A DEEPLY EMBEDDED SENSE OF RELIEF AND SATISFACTION, A PRIMITIVE PRICK OF GRATEFULNESS, AT HAVING BEEN SPARED SUCH DIFFICULTY AND CHALLENGE. WITNESS THE SCENE OF ANY ACCIDENT OR MISHAP. TYPICALLY IT ENGENDERS A BURST OF INTEREST AND CURIOSITY. SPECTATORS HOLD UP TRAFFIC AS THEY RUBBERNECK, CONVEYING AN ALMOST PERVERSE SENSE OF ENGAGEMENT IN THE DISASTERS OF OTHERS. DOES THIS PHENOMENON NOT EXPLAIN IN LARGE PART THE WIDE APPEAL OF TRAGIC AND PAINFUL REPORTING ON LOCAL EVENING TELEVISION NEWSCASTS? WHY DO DECENT PEOPLE FIND THEMSELVES FASCINATED BY THE SUFFERING OF OTHERS? IN PART IT TOUCHES THAT WHICH ENABLES US TO FEEL EMPATHIC TOWARD OTHERS. I AM CONVINCED, HOWEVER, THAT A DEEPLY INGRAINED SENSE OF GRATEFULNESS IS ALSO TAPPED INTO AT SUCH TIMES. WHEN HEARING OF OR WATCHING THE CALMITIES OF OTHERS, WE SAY TO OURSELVES: “THANK GOD IT WASN’T ME! I THANK MY LUCKY STARS IT WAS THEIR FAMILY AND NOT MINE!” IT GOES WITHOUT SAYING THAT WE CERTAINLY WISH NO ILL ON OTHERS. YET, IF ANYONE IS TO BE SPARED THE WRATH OF GOD, FATE OR LUCK, WHY NOT MY LOVED ONES AND ME? HOWEVER SELFISH THE RESPONSE, IT IS STILL COLORED BY THE SENSE OF BEING FORTUNATE, OF BEING BLESSED, LEADING TO A FEELING OF PRIMITIVE, EVEN ‘SELFISH’ GRATITUDE. PERHAPS THE HUMAN PSYCHE IS CONDITIONED TO REACT TO THE FACT OF SURVIVAL, OUR EARLIEST AND MOST PERVASIVE HUMAN INSTINCT, IN A WAY THAT CAN ONLY BE DESCRIBED AS GRATEFULNESS, TO WHOMEVER OR WHATEVER THE FEELING MAY BE DIRECTED. THIS IS THE BASIS UPON WHICH WE CAN ESTABLISH A MORE MATURE AND ALTRUISTIC ATTITUDE OF GRATEFULNES, ONE THAT EMBRACES OUR HONEST CONCERN FOR OTHERS AND FINDS EXPRESSION IN ACTS OF GENEROSITY AND GOODNESS. WHEN RECOGNIZING OUR GOOD FORTUNE, WHY NOT ENLARGE OUR SENSE OF THANKFULNESS AND WELL-BEING INTO A RESPONSE OF CONCERN AND LOVE FOR OTHERS? I AM CONVINCED THAT SUCH A STIRRING OF OUR SOULS WILL BRING MUCH SPIRITUAL ENRICHMENT TO OURSELVES AS WELL. I was helpless. My mind went blank as efforts to stop the car failed and we slid directly into the side of a truck carrying a propane tank, stuck in the snow banks on either side of the country road. “Get out of the car” came the shout from the truck’s cabin. As he lowered himself from his elevated perch behind the wheel, the driver calmly added “Turn off the motor.” The truck was barely scratched. The front of my car looked like it had gone ten rounds in the ring with a championship boxer, its front hood a crunched mass of metal. It was New Year’s Eve. The bus scheduled to bring my daughter back to New York never arrived. We, together with about ten other shivering souls, stood in front of what used to be a Rexall drugstore in the town of Lee. After a three-quarters of an hour delay, someone left the huddled group to inquire , at a local café where bus tickets were sold, about some clarification. Passengers for Boston were in luck. There was no information for those heading for New York. I waited a few minutes longer then proceeded to investigate myself. While polite and friendly, the café owner was completely uninformed about the bus’s status. After several failed attempts to reach the offices of the bus company, I was told that bus service from Lee had been cancelled for that day because of snowy conditions. A bus for New York had left earlier from a nearby location .Angry and bewildered, our group of stalwarts decided to wait a little longer. The owner of the café appeared on his way to a nearby bank. I rushed over to him, desperate for information. He finally had been notified that an additional bus was put into service and was expected to arrive shortly. We waited for almost another hour, at which point we all decided to head back that afternoon to the city in our family car. What followed was a frantic two hours of telephone calls to AAA, my insurance company, car rental establishments-all of which were either closed for the holiday or without any available cars-my son in the city whom we hoped would be well enough to bring us home( He had been under the weather the day before), and filling out an accident report for a police officer who had been called to the scene. Finally all required arrangements were completed. We sat in our living room. A silent heaviness hung over the three of us. “Thank God we were not hurt. It could have been so much worse,” I heard myself saying aloud attempting to not only reassure my wife and daughter, but especially myself. Fleetingly, I was grateful for having been spared the worse of possible scenarios. Yet, my mind could not resist entertaining a series of “whys” and “what ifs!” Why did this have to happen? Why did the propane company have to deliver gas precisely on this day? What if the bus had arrived on time and my wife and I would have returned home an hour earlier? What if I had tried to swerve the car into the embankment, applied the hand brakes, or done anything else to prevent this from happening? To be honest, the battle between being grateful for my family’s well-being and being spared further hardship, and feelings of resentment couched in terms of what if or what should have been, continued almost unabatedly. Indeed, I felt I was locked in an internal struggle for the hoped for triumph of gratefulness. The struggle goes on; what’s left to be done is to reach out as best I can, in words, thoughts and feelings, to the comforting and strengthening reality of gratefulness in our lives. This continues to be my spiritual journey. I have always believed, and continue to believe that the essence of prayer is its intentionality. Its importance and efficacy are contained in its “kavanah”-the inner awareness of its meaning, its direction and purpose. Mechanical prayer, rote recitation of words was always a source of challenge and frustration in my own pursuit of prayer’s meaning. I understand the words' meaning; my elusive goal was the focus and concentration necessary for spiritually enriching prayer. This approach to prayer is a religious ideal that many strive for, but is not easily attainable. Logically and intellectually, I have always appreciated and loved the Hebrew language as the vehicle for Jewish prayer. I have understood the unique importance of praying in Hebrew. Yet, because of my preoccupation with discovering the soul of prayer and its resonance in my own soul, external expression has become less and less important to me. Last night I had an experience that allowed me to profoundly feel the centrality of language in the experience of prayer. We have the good fortune to own a log house in the Berkshires. Close by, directly across the road from the Tanglewood Music Festival, is a sprawling piece of property devoted to spiritual pursuits-Kripalu, a place of yoga and meditation. We were informed that three days prior to the New Year, the center conducts an uninterrupted period of chanting as a way to end the year in a spiritually meaningful way. This experience is known as –“Septah”-seven, related to the tradition in India where seven full days are set aside for continuous chanting. My wife, daughter and I decided to look in on the event. Having some meditative experience, we were not entirely uncomfortable with the surroundings and the practice. In spite of the evident strangeness of the environment and the tradition from which this practice originates, I felt that out of personal spiritual interest and from the perspective of the universal quality of the experience,there would be no contradiction or conflict with my personal attachments to Judaism. We sat, the mantra was recited; its repetitiveness began to create a hypnotic spell. I chanted the words, trying to focus on their meaning. I became restless and dissatisfied. The words were too alien; I couldn’t connect with them in a natural and meaningful way. I began to unconsciously relate the Sanskrit words to similar sounding Hebrew words. OM became the Hebrew for people or nation. NAMAH I defined as pleasant or delightful. SHIVAYAH was more complicated and required more interpretive effort. Yah is God’s name, I thought. SHIVA emerged as seven, or a word related to the Hebrew for “return.” Desperately I tried to transform Sanskrit into Hebrew! It didn’t work. My mind then led me to Hebrew prayer phrases that could conceivably fit the chant. I tried the Shema. No success. Other attempts also failed. It then occurred to me to return to a mantra which I didn’t chant but rather recited silently during my personal meditations.”MODEH ANI LEFANECHA”- I am grateful in Your Presence. In almost a whisper, I began to chant the Hebrew prayer of awakening each morning against the soaring sounds of Sanskrit that filled the Kirpalu sanctuary. I realized then the powerful need to pray, to chant and to meditate in the idiom of one’s own deeply emotional connections and attachments. The destination of universal spiritual enlightenment can be arrived at only through the parochial, familiar, and deeply ingrained nuances of one’s immediate history and personal frame of reference. To quote a further thought on chanting-“The repetition of the Name is found in all religious practice…the names of a friend or child or lover …point to the physical/emotional part of that person. Sacred names are revealed names.”(Krishna Das) For the Name to be of significance there must be a dimension of intimacy and nearness, like a friend, child or lover. Thus, the indispensability of chanting in a language that belongs to you, that is at the core of your personal , familial and communal being. The next time I chant, it will be in Hebrew, the sacred tongue of the Bible and the Jewish people. An afterthought. Perhaps another Hebrew phrase, the one recited seven times at the close of the Day of Atonement, does indeed fit the Om Nama Shivaya chant. "HASHEM HU HA' ELOHIM": The NAME( God) is the Lord. Try it at your next meditative chant. It may feel right!